I was totally intrigued by the Spartan commercial video when it was firstly being introduced in Singapore. 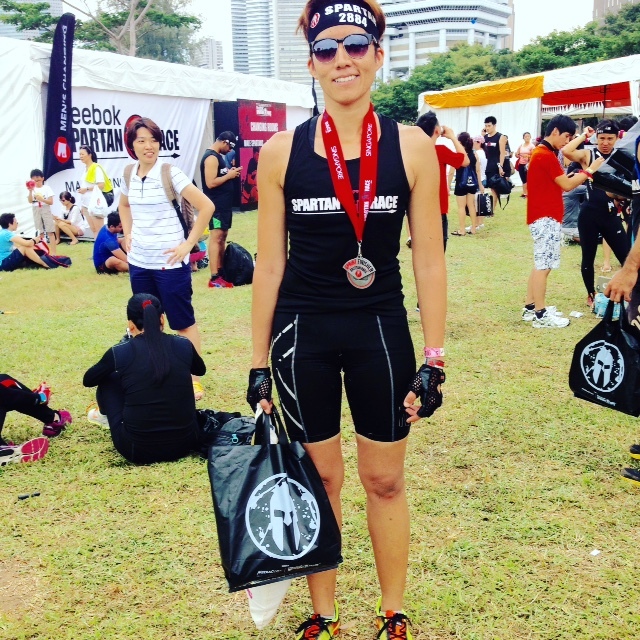 “Spartan Race is coming to Singapore! Get your groove on and sign up! Feel alive!” Those words stayed in-grained in me for weeks. I contemplated what it seemed like forever if I should take part. As a 39 year old…..well I believe I am rather fit; Queen of HIIT (high intensity interval training) and Fat Slayer; names given by my clients, I reckon that completing Spartan race is a highly achievable goal. I am past my mid-life crisis and reaching 40s so I better achieve some fitness goals. My earlier-day fitness journey had taken me places I never thought I would be completing: 5KM Charity Run in Toronto (2004), Climbing CN Tower 1789 steps in 24 minutes, (2005) and a 5KM Swim. So a Spartan Sprint seemed manageable. My objective was to finish the race and not race against time. I signed up 5 months before the race and only began training in June. Later on, I learnt that 2 of my clients were taking part in the race with their husbands. They were pretty good runners. I hate running to be honest; I only run when I need to; like running away from provoked dogs or attackers. If I joined them, I feared that I would be left behind. Oh darn, I signed up as an individual racer finally. Training began in June and it was mostly building on my stamina and endurance. Since I hate running, I had to start training running. Sprint was advertised as 3KM run plus 20 odd obstacles. If failed to complete an obstacle, 30-burpee penalty was implied. The average sprint takes about 2 hours. No sweat. And, again, I just needed to complete the race. “Who are you?” The Spartan Announcer screamed. “We are Spartans!” The racers screamed back. “I can’t hear you!” The Spartan Announcer shouted back. “We are Spartans AROO!” We shouted back with much effort. This kept going for a good 5 minutes. I was already getting exhausted from the screaming, however, inside me I was nervous as hell. I was already up at 6AM on race day and stared at the ceiling still undecided. “I think I am getting a cold. I think I am getting a fever.” Touched my forehead and tried blowing my nose. Gosh I was freaking out in my head. I just want to stay in bed and skip the race!” After about an hour, I finally jumped out of the bed, got dressed and hopped into a cab to the race venue. The hype was real. There was a huge blazing fire at the finish line. There were thousands of racers at the venue and most had completed the race; they looked exhausted but happy. It was 30 minutes to my race time. Weather was great even thought it drizzled a little and it wasn’t too hot. “AROO AROO AROO!” 3 cheers from us and off we ran to our first obstacle: jumping over a short wall followed by barbed wire crawl. The climb over a 6 meters tall cargo net looked horrifying as it is. Fortunately, I made it down without falling. Running started for 3KM and I ran without stopping. I was pretty proud of myself. Then the obstacles start to come hard and heavy. The monkey bars were wide both in grip and space, so that was a fail. “30 burpees down!” shouted one of the Spartan marshals. I was surprised to see many muscular guys drop at the monkey bar station too. Then came the Hercules Hoist; it was pretty easy for me. The objective is to hoist a 20kg object from bottom to top and then let it descend slowly. “Do not drop it. If you dropped it, 30 burpees!” shouted the Spartan marshals around us. After successfully hoisting it down, I hurried to the next station; 20kg sandbag carry station where we had to carry the sandbag from one point to another. We could either run or brisk walk with it. It was running again and it seemed like another 3KM run. Next station was Spear Throw. I swear I threw at least 3 times but it missed. 30 burpees again! Tire Flipping was the easiest for me as I had trained at Crossfit. It took me a minute to complete the obstacle. The task was to flip the car tire at least 200 meters from the finishing line and then back. Off to the next station was the Boulder Climb. The minute I stepped onto a block I started to get muscle cramp. As I had mentioned earlier, I am not a runner therefore the chance of getting calf muscle cramp is higher than any trained runner. “Excuses!” Fortunately, a Paramedic came to my distress and off I ran again to what I saw must have been a 20-foot-high wooden wall in the distance. I panicked. We had to hoist ourselves over the A-frame wall. I ran as fast I could and tried to hoist my body up on the wall but I was too slow and momentum was not enough. A nice Spartan volunteer offered me to step onto his palms as I climbed over it. I was grateful. Then there was the Bucket Brigade where women were requested to fill a bucket up to the brim with more than 30KG of rocks, and we had to walk carrying the bucket at least 300 meters to and fro following by emptying the bucket at the starting point. We were not permitted to carry on our shoulders, which would have been easier. “I don’t think I can hold this bucket without carrying on our shoulders!” I said out loud. Some Spartan female Marshal shouted, “Yes you can and no not on your shoulders otherwise 30-burpees!” So I brisk walked away with the bucket. There was not a single mud trench, which they are famous for in every Spartan race. However, there was an obstacle that you had to walk in muddy water. It was filled in a large through and once you are out of it, you had to rope climb, it was at least 15 meters tall and ring the bell and then climb down. I have not perfected this skill through Crossfit. My arms were vibrating hard as I climbed up and it did not help when the rope was soaking wet and covered with mud. It was impossible to get a foot grip. Here is where I saw plenty of ripped dudes taking their 30-burpee penalty along with me. And, before the big jump over the fire, this was the part that everyone said would be the worst; The Barbed Wire Crawl. Crawling slowed me down in the beginning so I resorted to rolling. Luckily, it did not make me nauseous. A couple of ripped guys were crawling at snail pace and nearly bumped into me. I knew I had picked the right method and roughed out 300 meters of hell. Toward the end of the muddy field, grown muscular men were just lying there, waiting for someone to kick them so they were forced to move forward. And then there was the climb over a metal wall with a thick rope pulling you up and then climbing down via the cargo nets. I was contemplating if I should wear my lightweight five-finger Vibram shoes in the morning but changed my mind to wearing Reebok “All Terrain” shoes with much better grips on the bottom. It was at least 20-feet tall and climbing up was no easy task. The wall was slippery and wet. Many others were already tired therefore slipped while pulling themselves up. “Hi, please help me up.” I said to this big burly guy sitting right on top helping people up. Bless his soul. I did not panic climbing down as this time I knew it was close to finished. The big leap over the fire was by far the easiest thing I did all day! It took me 1:59, which was above what I had expected. It was not a race against time as I was just trying to get through it. At the end of the day, I will say this: that troy was not a sprint. It was a 6KM run which was advertised for only 3KM and conquered close to 27 obstacles, which was advertised for only 20. And now, for better or worse, I know I would have to eventually give Spartan Super a try. After that, I know I could fully rock at least a Spartan Trifecta. Hmm it looks like your blog ate my first comment (it was extremely long) so I guess I’ll just sum it up what I had written and say, I’m thoroughly enjoying your blog. I as well am an aspiring blog writer but I’m still new to everything. Do you have any helpful hints for rookie blog writers? I’d certainly appreciate it. Hey very cool web site!! Guy .. Excellent .. Amazing .. I will bookmark your website and take the feeds additionally…I am satisfied to search out a lot of helpful info here within the put up, we need develop more strategies in this regard, thanks for sharing. . . . . .